The 1967 She Country Special was created by Ann Goodro of William Goodro Inc in Denver. 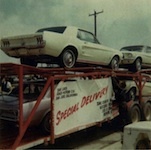 The dealership ordered the most Country Special Mustangs at the time. Craig and Denise MacGregor; who just bought one of these cars and contacted Goodro Ford Dealer Ann Goodro. 48 cars were ordered, 12 each in the pastel colors of Evening Orchard (metallic lavender), Bermuda Sand, Autumn Smoke (metallic gray), and Limelite Green. Thanks to Tony Popish for the color names. The cars were based on the Ski Country Special, had a special decal, and were only sold at William Goodro. The She Country Specials were not limited to hardtops and/or fastbacks, there were convertibles as well. This is one of only 48 Denver area, 1967 She Country Special Mustangs which was a creation of Ann Goodro of William Goodro Ford in April of 1967. Craig and Denise MacGregor of Australia just recently bought this Mustang for a Shelby convertible project, but after requesting a Marti report, the car turns out to be one of the special ordered She Country Special Mustangs. Craig and Denise was able to contact Ann Goodro to find that the car was probably originally Limelight Green which was one of the 4 pastel colors that Ann selected for the promotion. Tony Popish has helped out with finding an advertisement of the time which lists the colors as Evening Orchid (metallic lavender), Bermuda Sand, Autumn Smoke (metallic gray), and Limelite Green. Check out the photos Ann Goodro has of the promotion! This car was born with a 2U Parchment interior. This car also came with factory air, power roof, C-code 289 V8 engine, manual transmission, exterior decor (wheel lip molding, pop open gas cap, chrome bumper accents, vented hood), and a She Country Special decal but is now missing. Craig and Denise will be restoring the car rather than converting it to a Shelby.